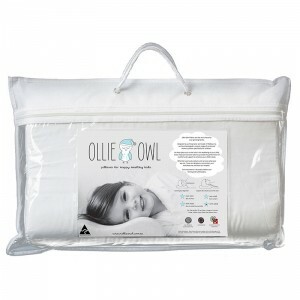 The Ollie Owl pillow is a great pillow for children, This is similar to the adult pillows we sell but with no adjustable parts and the height is lower to account for the different sizes that our children are compared to us adults. So if you find your children stealing your memory foam pillow this is the best option for them. Ollie Owl Dream Mini (2-4yrs) and Midi (5-8yrs)pillow – Made and designed here in Australia. Cover and pillow are dust-mite resistant, hypo-allergenic mould-free foam with anti-bacterial properties – suitable for allergy or asthma suffers. Non toxic and moisture resistant. Cushions and absorbs movement; the pillow is designed to keep its shape & allows even distribution of head pressure during sleep. with a one year guarantee. This is similar to the adult pillows we sell but with no adjustable parts and the height is lower to account for the different sizes that our children are compared to us adults. So if you find your children stealing your memory foam pillow this is the best option for them. All pillows not suitable for babies – please see the SIDS and Kids safe sleeping guidelines for when to buy a pillow for your child.